I was pleased to see one of my new, “bestest” colleagues I got to know this year, Sue Waters get a well deserved recognition link from Stephen Downes for her chock full of good advice post on My Advice On Being A More Effective Blogger! (For another gem see her illustrated post on getting more out of Google Reader). The advice about reading other blogs and taking part in conversations is spot on. If you think your blog is a ‘publication’ or a form of ‘broadcasting’ then it will not be very successful. I cannot echo this enough, and have long done so, to remind people in all the excitement and frenzy of “publishing” in this user-generated, everyone can create, Read/Write web, the act of participating in other people’s spaces sometimes gets lost. It’s something I mentioned recently as “everyone’s favorite subject” – and the point there was not to promote vanity, but to underscore the power of acknowledgement- be it a comment, an attribution link, or just credit made public. I was harping on it back in 2003 with a statement that “Blogging is a Social Act” (note to web selves- the old “Jade” server this BlogShop once resided on was axed after I left Maricopa- please all bless the Internet Archive’s Wayback Machine for locating lost pages). I also stress the importance of having a blogging routine – I have been in meetings all day today but the day isn’t done until the newsletter goes out. but I add another routine- taking time when cruising Twitter streams or RSS summaries- jump over to someone else’s blog and write a comment. Not just “nice post”- but add something, disagree, provide context, references, join the conversation. And this all leads me to the actual long winded end goal of this post- a “blogging” habit I try to do that has nothing to do with blogs but with photos. 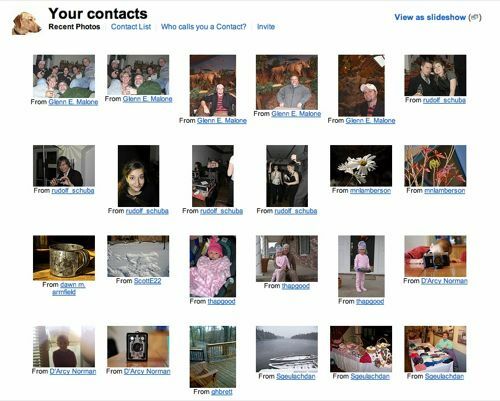 On some regular basis, I peruse my flickr contact photo stream– the latest photos of all people I have added as contacts (please don’t say, “I have no contacts”- this says you have missed the participating part of the social sharing of photos). In a matter of say, 15 minutes, I can send comments or acknowledgments to a lot of people who’s pictures I admire, or who have posted something that caught my eye, or reminded me of my own experience to share. So yes, it takes some time from those important other tasks (deleting email, jabbering on twitter, poking Facebook “friends”), but remind yourself of just how damn good it feels when someone else, especially someone you don’t know, acknowledges your blog post, your photo, yourself with even a small comment. Believe me, it goes a long way, on both ends of the giver and receiver. So jump out of your own publishing corner and spend some time in in those of others. I guarantee, over time, it pays itself forward. Hi Alan – thanks for telling others about my posts, linking to them and calling me one of my “bestest” colleague. Hopefully my tips help others with their own blogging. Please note – normally I do not make changes to posts the next day but the post on Google Reader has been added to twice today as I have been supplied further information (did not want to put into a separate post because I wanted to keep it all together). Totally agree about the conversation but most my effort has been on people’s blogs and not thought about Flickr. However I do have the feed of photos coming from my contacts into Google Reader so looks like have no excuse. And there are the twitter users who have tons of followers but don’t follow as many or just a very few. Great post and reminder about the art of conversation.